May 2013 – Obi-Wandi, a retrogaming retrographer. 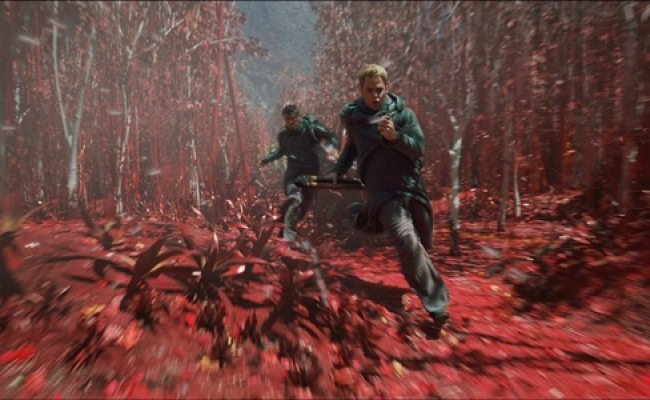 I finally had a chance to enjoy the latest major strides taken in the field of visual effects, J. J. Abrams’s latest entry in his alternate universe Star Trek ouevre, Into Darkness. Industrial Light and Magic had once again been tasked with rendering the Final Frontier. To justly rate the stupenduous effort, one must look no further than the opening moments. The other day I glimpsed the shocking image of the starship Enterprise falling out of the sky, a stunning memento of last year’s Star Trek Into Darkness teaser, where the vessel crashes in all the digital particle glory one cannot possibly imagine. It’s a visual spectacle but while it surely underlines the dark tone the campaign is aiming for and its edgy “world falling apart”-rhethoric, I found it to be somewhat self-important and, frankly, not quite as moving at all. 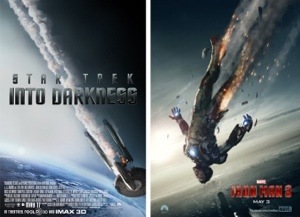 Compare the smoking starship with Tony Stark’s struggle in the Iron Man 3 teaser campaign on the right. Both posters focus on what are some of ILM’s greatest visuals, but I find myself invested in the character of Tony Stark on the one hand and spoiled by a stunning turn of events exploited for a shock-and-awe tease on the other. I want to see what Stark will do in the next Iron Man film – and his suit getting smacked is a series staple, not a major spoiler – but am quite indifferent to the Star Trek poster. It already familiarises me with a dramatic turn of events that I am now fully prepared for – despite having avoided everything (except for the very first teaser). In preparation for J.J. Abrams’s sophomore Starfleet epic, I reviewed the OST movies (1979-91) and was awed not only by the characters’ grappling with retirement and obsolence, but how ILM’s marvelous rendition of the Enterprise’s destruction in Star Trek III: The Search for Spock not only holds up extremly well today, but was concisely predicated on the characters’ disposition: seasoned, aged and battle-worn, their (final) realisation of defeat and loss was overwhelming and captured in this signature shot from Leonard Nimoy’s 1984 directorial effort. Most importantly, the destruction of the original Enterprise was an event that in 1984 the average film-goer was completely unprepared for, so the emotional impact on the characters and audiences was mutual. And therein lies the problem of modern marketeering. Campaigning for an upcoming motion picture – a product whose singular selling point is telling a story visually using images, sounds and events unseen before – must not reveal the finished product to the point where audiences are effectively ahead of the characters all the time. The first viewing will otherwise strangely seem like the umpteenth repeat on a cable television due to the awkward familiarity with the plot. Take Kathryn Bigelow’s much-coveted Zero Dark Thirty: scores of trailers were telegraphing the entire film in advance. The filmmakers’ and marketeers’ pride in the finished product is as palpable as it is ruinous to the filmgoing experience. It’s not simply the resolution, which is well known in the case of ZD30, but the various set pieces which were distinctly laid out: the shots, angles, colours, framing, seriously deflating the first viewing experience. People walk into movies knowing what sequences are about to be projected these days. Everything marketing throws at you nowadays prepares everyone for what to expect: an unsettling common occurrence these days. Let us consider a teaser campaign for one of last year’s major tentpoles, Ridley Scott’s Prometheus in greater detail to elaborate on the problematic teaser situation.